One notable affair in the Cliff’s history was the great landslip of 1882 which blocked the Holloway Road and completely destroyed Rolley House. It is said that Sunday dinner was ready on the table and the family went out by the front door as the landslide came in at the back. Up to a few years ago the sole survivor of the catastrophe was an aged fruit tree struggling for existence among boulders and brushwood, but a spar working party quite recently unearthed a sun dial. One of the most noted landmarks in the central part of the county is Crich Stand or Tower, which is a most conspicuous object for many miles round and which affords one of the finest views Derbyshire can boast. We regret to hear that this well-known shrine of picturesque loving pilgrims is in great danger of being destroyed. Within the last few days a large "crack" has been discovered on Crich Cliff, extending between one and 200 yards from SW to N and within 30 yards of the "Stand" or tower, a landmark well known to visitors, tourists, and excursionists from all parts to Matlock Bath and the charming valley of the Derwent. For many years extensive limestone quarries have been excavated by the Clay Cross Company at Crich, which quarries were first commenced by George Stephenson, who personally planned railway from Crich to the large range of Lime Kilns at Ambergate; at the president time nearly 100 men are employed, being a source of considerable benefit to the neighbourhood. Some years ago their labours resulted in a fall of several hundred thousand tons of limestone which is not yet been entirely removed, but no one until a few days ago was aware that another and for more extensive "split or crack" had taken place, hence sensation in the district on Sunday last, when some hundreds of people visited the "stand" and its surroundings. From a cursory survey it appears that between 30,000 and 40,000 square yards this of surface covering a mass of something like 2,000,000 tons of limestone will be carried into the valley below at no distant date, providing the Company go on taking away the base and foot of rock which is evidently supporting the stupendous quantity above and beyond it. To give some idea of this enormous mass we may say it will take eighteen to twenty years hard work with the staff of workmen equal to the present one, to clear it away. But to our old "landmark": the previous one to that existing now was built in 1788: storm and tempest made havoc with it and it became a wreck. 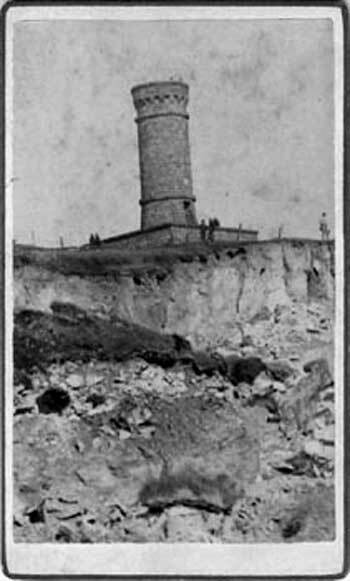 The present one now threatened was erected in 1851 as stated on a metal tablet on the parapet which reads thus: "this tower, rebuilt in 1851, is 955 feet above the level of the sea according to the ordnance survey." We trust those who are interested in the preservation of this beacon will take due care to preserve in the best way possible, one of the finest if not the finest panoramic view in the whole County. (From our own correspondent). On Thursday afternoon last, Crich was in a great state of excitement, owing to a large portion of the cliff giving way, which has been worked extensively by the Clay Cross Company for many years. 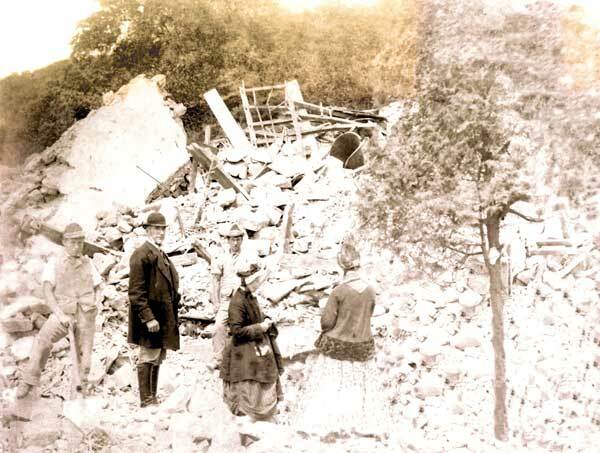 Cliff Wood House, the residence of Mrs Luke Alsop, with a great portion of her valuable furniture, together with three cottages became a total wreck. As the slip became so rapid, Mrs Alsop was able to remove only a small portion of her furniture. Fortunately no lives were lost. The turnpike road from Crich to Cromford is diverted in consequence, and the land is still on the move, being thronged with visitors anxious to get a view of the wonderful sight. Another account says :- The alarm was given to Mrs Alsop, who resided in a house on the side of the cliff. The inmates made their escape, and Mrs Alsop went for her brother, Mr Stone, solicitor, of Wirksworth. He was soon at the place, and began to take inventory of the goods, but quickly had to make good his escape, and stand at a distance to see the house carried quite across the road and completely overturned. The other houses a little further along the road, and on the opposite side, were completely wrecked in a little while, and about seven o’clock the walls of another gave way and the roof fell in. Fortunately everyone had time to escape. The turnpike road was lifted out of its place, and carried several yards into the adjoining fields. The quarry made a way for the traffic through the meadows. It is supposed that hundreds of thousands of tons have fallen. Crowds of people soon made for the scene. That part of the hill which slopes away from the most prominent object in Derbyshire, "Crich Stand," towards the valley of the Derwent, was last week scene of an extraordinary landslip, by which a piece of land, varying from half a dozen to 60 feet in depth, and as large or larger than Derby marketplace in extent, was carried forward from the very foot of the stand, a distance of several feet towards the valley, and a comfortable villa and three cottages at the foot of the hill were destroyed. Crich Stand which is situated nearly 1000 feet above the sea level, affords one of the most extensive views in the whole county, the circle of the horizon extending probably into three or four of the border counties. The hill, as most of our readers know, has the appearance of being perched on the top of a broader one, the sides of which slope down in one direction towards the Amber, and in the other towards the Derwent, which with a canal and railway look like narrow strips as they run along the distant valley. 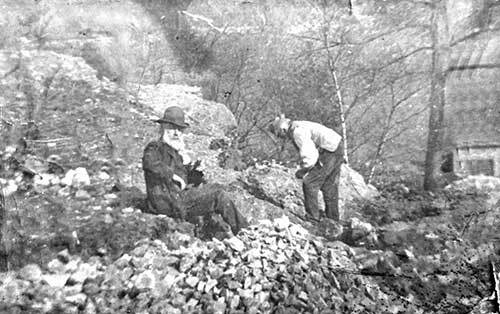 A gigantic quarry has been hewn out of the side of the topmost hill by the Clay Cross Company, who have been operating there for nearly half a century, and have made a railway for the conveyance of the limestone down to their works at Ambergate, where they convert it into lime, and use it for purposes connected with the smelting of iron. The appearance of the hill today is very similar to that of a plum pudding from which a big quarter has been cut, the piece of Holly usually put on the top being represented by the familiar Stand. The portion of the hill which is slipped is that on the western side of the quarry. Signs of an impending slip have been shown for some time. Indeed, landslips have not been uncommon in the locality, one cottage held together by bolts and bars bearing testimony to a rather rough shaking received in one of them. About 12 months ago a crack appeared near the stand, and in order to keep the water out, and if possible, to prevent any further slip, the hole was filled up. From time to time however, the widening of the filled up gap and the displacement of stones on the ledges in the quarry showed that the movement was still going on, and last week the signs still further developed, until on Thursday afternoon the whole mass slipped bodily forward, and it is just probable that the movement may not yet be completed. To the inhabitants of the houses the danger was an appalling one, and it is a matter of great thankfulness that they escaped without personal injury. The houses were the property of Mrs Alsop, a widow lady, who resided in the villa, a compact and charmingly situated stone building surrounded by an orchard and garden, and standing on the hillside of the road, and where her late husband was a surveyor in large practice, and also "bar master to the Queen", his duty being to claim for the Crown certain royalties upon the local lead taken from the mines in the locality. The three cottages were on the other side, and one of them was uninhabited. For seeing that a slip was inevitable the Play Cross Company may overtures some time ago for the purchase of the latest property, for they came to nothing, and Mrs Alsop continued to reside there until the events of Thursday. The recent heavy rains made the expected fall more probable than ever; and, moreover, the face of the cliff presented appearances which could not be mistaken. On Wednesday evening another warning was given to Mrs Alsop, and at the same time the intelligence of the condition of the cliff was conveyed to tenants in the cottages adjoining. The latter, John Roe and James Tomlinson, took the alarm, and early the following morning they began to remove their furniture. Mrs Alsop, however, remained quiet, and about half past nine on Thursday morning Mr S Bower, road surveyor, of Crich, hearing that the fissure in the limestone was increasing, advised her to remove her furniture before it was too late. Nothing was done at that time, and when Mr Bower called half an hour later and asked permission to fetch carters to convey the furniture to Cromford where storage for the goods was to be had, Mrs Alsop said she was waiting the arrival of her solicitor, Mr Stone, of Wirksworth. The cliff was narrowly watched by the officials of the company during the whole of Thursday morning, and as noon approached it was seen that there was abundant reason for the alarm. That the cliff was moving became evident from the falling stones from one ledge to another, and again falling after they appeared to have settled. Mr Bogue, general manager, instructed some of the men at once to hasten to Mrs Alsop to warn her of her danger, and to assist in removing her furniture. That lady was now thoroughly alarmed, and whilst the men were removing the first articles of furniture they could reach, she secured her plate, and had some paintings carried to a place of safety. Her solicitor, Mr Stone, of Wirksworth, was in the house of the time, and in the expectation that the whole of the furniture could not be removed before the house fell, he began to make an inventory. This, however, had not proceeded for before an unmistakable motion became apparent. Mr Stone and the men rushed from the house; and soon afterwards the lower face of the cliff was seen slowly moving as if pushed by some greater force above. A little later, the house began to slide towards the road, and in instant or two afterwards it fell as though it were a house built of cards. The cottages fell soon afterwards. An eyewitness described the road as rising with the pressure of the cliff behind it, and this rising motion was communicated to the cottages. They were seen to rise as if passed from underneath; then the walls cracked and almost immediately afterwards the cottages were lying in ruins. As soon as the movement – which was generally gradual, and frequently accompanied by noises resembling thunder – was over, a larger number of men set to work in recovering Mrs Alsop's effects. Her furniture had been literally broken into sticks, and a variety of articles were discovered in most out of the way places. She herself took refuge in a neighbouring farmhouse; and the recovery of her property was watched by an interested crowd during Friday and Saturday. Various theories have been set on foot as to the cause of the landslip; and the most tenable seems to be that which ascribes it to the slipperiness of a bed of clay. Excavations made some years ago brought to light a bed of lava, indicating that a volcanic agency had been at work in the upheaval of the hill. Indeed, its history from a geological point of view will be most interesting, from amongst the stones used in building the dry walls which stand on its side may be seen many fossils of marine and tropical origin, such as shells and corals. It was also found that a bed of clay divided the upper stratum of rock from the lower, and it is supposed that the clay lies under the hill in the form of an open umbrella, the edge of which (at the site of the landslip) terminates in the meadow in the rear of the cottages; and that – a considerable support having been withdrawn by the excavation from the quarry – the slip has been entirely upon the spread of clay, on the end of which, there being no further facilities for the continuation of the slide, the thin upper stratum on which stood the house and cottages has been "pushed up." Looking at the quarry the spectacle is an interesting one, from the curious positions in which pieces of stone have been left – some clinging by their superincumbent weight merely, to the rock from which they been shaken, and others lying in a state of tumble, as if they been poured out from a gigantic sugar basin. But from the Stand the site is still more striking. Little and innocent looking rifts appear in the ground within a few feet of its base, and in some places can be spanned by one's hand, and others are barely discernible in the long grass. A careful inspection, however, show that these rifts have a depth of 40 feet or 50 feet, and that the bottom is sometimes wider than the top. Further away from the Stand the fissures are wider and in many places are two or three yards in width, leaving bare and clearly marked with the groovings and scratchings of the rock the bed of clay upon which the whole mass has most likely been sliding. One thing clearly shown by the dulled appearance of the stone is that the fractures occurred a long time before last week. Except in one or two cases there are no signs of the "pushing up" process evidenced at the bottom of the hill. On the extreme western edge of the slip there is, however, a rather remarkable deposit of freshly fractured stone, weighing more than a score of tons, which seems to have been thrown up out of a broad chasm on the edge of which it stands. Crich Stand itself does not appear to be in any immediate danger, as it is built on the very top of the hill. It has apparently slight lean towards the slip; but this is said to be through a fault in the foundation. A large number of persons have been and are visiting the place. THE GREAT LANDSLIP AT CRICH particulars of which have been furnished elsewhere in our columns is one of those things which according to the old proverb, if "long talked of, comes at last." The slip very nearly included the well-known landmark, Crich Stand (originally erected by Mr FRANCIS HURT, about 1789, and rebuild some years back), from whence a charming prospect of the valley of the Derwent is obtained. The destruction of Mrs ALSOP’S pretty residence is much to be regretted. It has been said that there is an infusion of the ridiculous even in moments of the greatest danger, and this element was not wanting here. Mrs ALSOP, when warned of the impending avalanche of stone, and implored to take measures for securing life and property, replied that "she was waiting for the arrival of her solicitor, Mr STONE." Meanwhile she was served with a permanent ejectment by a "stone of greater weight and overpowering influence," and had only just time to secure her silver and a few pictures, when her cottage collapsed like a house of cards. Crich – On the night of Monday, the 13th instant, between the hours of 10 and 12, at intervals, a most extraordinary noise, like that of distant thunder, which literally appeared to shake the earth for a considerable distance, was heard and felt in this neighbourhood; when it was ascertained from whence it proceeded immense crowds thronged to the place. The Clay Cross Company’s limestone works was situated at the base of the large mountain called the Cliff; where it was discovered that a fissure had been rent in the face of the quarry and from 10 to 12,000 tons of limestone sent shivering down in all directions. There is an immense peak separated by the fissure from the face of the rock; it stands in a very tottering and precarious position. Had the labourers employed by the company been at work, the probability is, they would have sustained loss of life or limb.